Unique Moments photography of Gig Harbor Washington Traveled to Minnesota to capture this wedding on Lake Superior. 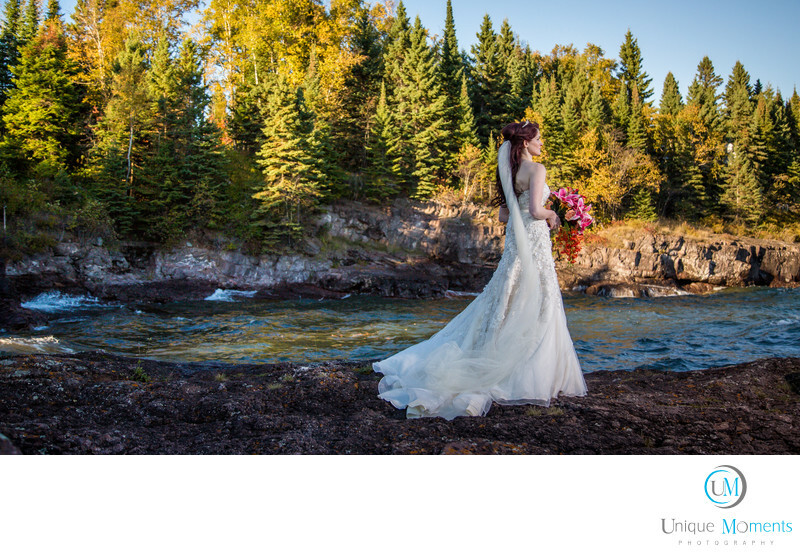 This image is one of our favorites for the 2015 season.The fall colors, blue waters of lake superior and a beautiful bride resulted in a stunning picture. We must admit it was really cold on the lake. The wind was blowing, the water temp was in the mid 40's, air temp wasn't much warmer,and the sun was setting fast. Our bride is a real trooper and knew this was our best chance to get a sunset type image. The ceremony started 3o minutes later and it was dark on the water before the ceremony ended. This image was captured with a single off camera flash strobe lighting the bride to the ambient light levels on camera right. Great locations and great lighting are what make great images. You cant miss at lake superior. Lighting can be tricky as it is similar to being at the beach with bright light reflecting off the water.